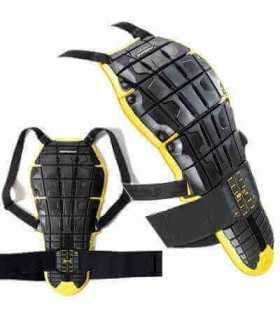 The Warrior technology is based on highly shock absorbing light composite materials cells. The Warrior technology is based on highly shock absorbing light composite materials cells. The result is a Level 2 CE certification. During certification tests for this kind of protectors, the required value of residual energy must not be over 18 KNs for level 1 and 9 KNs for level 2. The average residual energy of Warrior Back Lady is 7.8 KNs. Surprisingly light, thin and comfortable, this protector evolves the idea of the improved comfort as a factor in also improving safety, because it makes riding easier and lets the rider concentrate better on the road. The implementation of comfortable material and an innovative design allowed the Back Warrior Lady to sit under 560g of total weight. Great focus has been put on ergonomics too: a double fastening system on the belt and different size scales for man and lady guarantee a custom fitting from 145 cm up to 195 cm of rider's height. This customization is also aimed at keeping the protecotr tight against the rider's back and to not compromise the fitting of the jacket worn above the Back Warrior. Back Warrior is available in 4 different sizes for man and 2 different sizes in the Fit-For-Lady version.